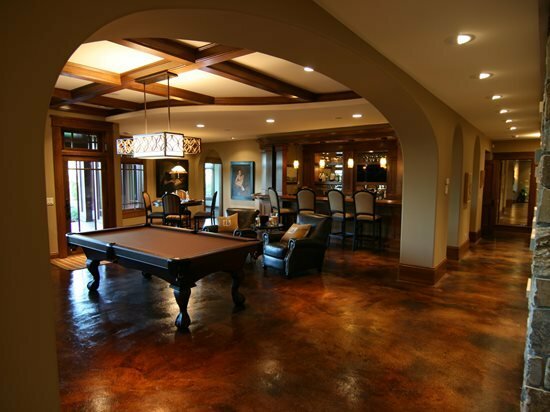 No type of flooring material is truly maintenance free, and the same holds true for decorative concrete. Concrete floors are relatively easy to care for when compared with other types of flooring, especially carpet, but they do require regular attention. How much maintenance your floor will need largely depends on the amount of traffic it receives. No joints, grout lines or fibers to trap dirt. Stain, water, and abrasion resistant when properly sealed. Pet-friendly, easy clean-up for muddy paws and accidents. Simple cleaning of dry or damp mopping. Minimal routine maintenance of reapplying sealer every few years. When designing your floor, keep in mind that saw cut patterns create narrow grooves in the surface that can trap dirt. In areas of heavy traffic, such as entrances and foyers, reduce maintenance and wear and tear by using indoor floor mats or rugs. Outdoor floor mats also help reduce the amount of dirt and grit that gets tracked in. Clean spills from the floor as quickly as possible so they don't absorb into the surface and cause staining. Concrete floors are a good choice for pet owners because they won’t trap pet dander and allow easy cleanup of muddy paws and pet accidents. Read more about why concrete floors are pet friendly. Only use cleaning solutions that are recommended by your contractor or the sealer or wax manufacturer. Avoid harsh cleaning products such as ammonia, citrus, bleach, vinegar or pine cleaners because they are not pH-neutral. Read more about choosing a concrete cleaner. Microfiber cleaning pads are recommended for both dry and damp mopping. Follow the maintenance schedule recommended by your concrete contractor to keep your decorative floor looking its best. Dry dust mop or damp mop regularly to keep away dirt and grime, cutting down on abrasion. Damp mop with a pH-neutral cleaner and water for an occasional deeper cleaning. Protect with a good film-forming sealer and a coat of wax or floor finish. Reapply as needed depending on wear, generally every few years. Follow the same regimen for stained floors in commercial settings; however, more frequent application of protective wax is needed due to the increased foot traffic. Stained floors should always be protected with a good floor sealer to help it resist water, dirt, stains and abrasion. This top layer of protection not only prolongs the life of your floor, it can also enhance the color and add sheen. Water-based sealers are generally recommended for indoor use because they don’t contain harmful fumes. For more information, see this list of common questions about concrete floor sealers. For further protection against stains, dirt and abrasion, many contractors recommend applying a good commercial-grade floor wax designed for concrete floors on top of the sealer. This layer helps preserve the sealer by taking the brunt of daily wear and tear. It is much easier to buff out minor scratches and wear patterns from wax, and wax is also easier to reapply than sealer. This wax coating is often referred to as a sacrificial protective layer. Dry dust mop regularly to remove dirt and grit. Damp mop occasionally with a pH-neutral cleaner or special cleaners and conditioners designed for polished concrete. These cleaners not only clean the surface, but leave behind a dirt-resistant film. They can be applied with a mop and do not require buffing. If the floor begins to eventually lose its shine, simply buffing the surface with a commercial polishing compound will often do the trick. If more touch-up is necessary, the floors can be lightly re-polished with a fine-grit abrasive. See this checklist for maintaining polished floors. Surfaces that haven’t been treated with decorative finishes such as staining or polishing still need routine maintenance. Similar to decorative concrete, the type and amount of maintenance depends on the wear and tear the floor is exposed to from light foot traffic to heavy vehicles and grease. Another consideration when cleaning plain concrete is why is it being cleaned? Is it routine maintenance or is it being prepared for staining or decorative application? Clean the surface of dust and debris with a broom, blower, or garden hose. For stains, first try warm water and a soft (non-metal) scrub brush. Graduate to mild soap to strong soap, and finally adding ammonia. Power washing can be done for exterior or semi-exterior surfaces such as garages. Sealing the concrete after a good cleaning can make the next go round much easier. Do not use muriatic acid to clean concrete if you are planning on staining the concrete in the future. For more on this and surface preparation prior to staining or decorative application, see Cleaning Floors Before Concrete Staining. In this video find out how to maintain a concrete floor that gets heavy use and foot traffic. In this video find out how to maintain a concrete floor that gets light use and foot traffic. If your concrete floor experiences minor cracks, scratches or gouges, these flaws can almost always be repaired with the proper patching material. If the cracking is more severe or widespread, then the floor may need to be resurfaced with an overlay. In some cases, it’s possible to accentuate existing floor cracks and make them part of the floor design through staining, saw cutting, and other techniques (see Incorporating Cracks in Concrete Floor Design). When applied properly, concrete floor stains and dyes penetrate deeply into the surface to provide permanent color that won’t flake, peel or fade. However acid stains, which react chemically with the concrete, can be temperamental and cause color variations that weren’t predicted. It’s also possible for stains from spills or other accidents to be absorbed into the concrete if the floor isn’t protected with a sealer or floor wax. There are several methods you can use to correct floor stains and discoloration, from applying a tinted sealer to changing the color entirely with a new coat of concrete stain or dye. See these tips for fixing discolored concrete floors.